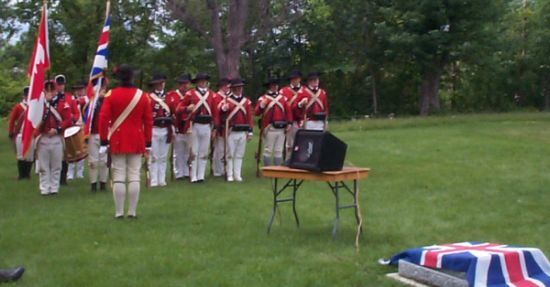 Loyalist Day was celebrated in a big way in Cornwall, Ontario. 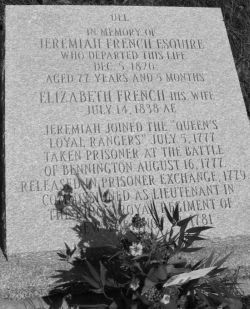 The Recreated King's Royal Regiment of New York, Trinity (Bishop Strachan Memorial) Anglican Church and Sir Guy Carleton and St. Lawrence Branches joined together in a church service and in a ceremony to dedicate a new tombstone to honour the memory of Loyalist Jeremiah French. Lieutenant Jeremiah French was born at Stratford, Connecticut July 8, 1743 and died at Maple Grove, Ontario December 5, 1820. He was the son of Jeremiah French Senior and Hannah Edwards. In 1762 he married Elizabeth Wheeler who was born December 14, 1745 and died July 14, 1838. He settled at Manchester, Vermont, then known as the New Hampshire Grants, in 1764. Here he was a town clerk, a select man and a constable for the Town of Manchester. At the beginning of the American Revolution he remained loyal to the Crown and enlisted in the Queen's Loyal Rangers, July 5, 1777. His lands in Manchester, Vermont were confiscated and he was put on a list of proscribed people. Jeremiah French fought at the Battle of Bennington and was taken prisoner August 16, 1777. Captain Justus Sherwood arranged a prisoner exchange in 1779. He resigned his commission in the Queen's Loyal Rangers after facing charges of corruption of which he was cleared. He joined the Second Battalion of the King's Royal Regiment of New York as a Lieutenant, November 18, 1781. After the conflict was over, he received a 2400 acre Loyalist grant at Maple Grove near Cornwall, Ontario. Jeremiah French was the first Member of the First Ontario Legislature for Stormont and one of the founders of Trinity Anglican Church. He was appointed a magistrate for the Eastern District in Upper Canada (Ontario) in 1792. He built a house on his grant at Maple Grove and his son-in-law George Robertson later added to it. His house was moved to Upper Canada Village during the construction of the Seaway. Today it is known as the Robertson House since the management of the Village has de-emphasized the Village's Loyalist heritage. Jeremiah French donated the property for the original Maple Grove Cemetery to the Trinity Anglican Church. The graveyard was relocated to its present site along the south side of Vincent Massey Drive during the Seaway construction. Maple Grove Cemetery is the only cemetery along the Seaway which had all its graves moved intact. Jeremiah French, his wife Elizabeth Wheeler and many of his Loyalist descendants are interred there. Today two of his original pre-revolutionary houses still stand in Manchester. His red Yorker Loyalist uniform is part of a Loyalist display at the Canadian War Museum in Ottawa. His uniform also formed part of the postal first day cover which was issued to mark the opening of the New Canadian War Museum in Ottawa. Here is how this project evolved. Last summer Shaun Wallace searched Maple Grove Cemetery and found the original marker for Jeremiah French lying in pieces half buried in the ground. Previously Merle and Diana French had uncovered it. Shaun approached Gavin Watt, Commander of the KRRNY and Carol Goddard, President of St. Lawrence Branch and asked for their support for this project. He then asked George Anderson if he would back the restoration. George, Shaun, Carol and Captain Michael Eamer formed a committee. Shaun represented and coordinated activities with the Yorkers. George worked with Archdeacon Ross Moulton of Trinity Anglican Church and Sylvia Powers of Sir Guy Carleton Branch. Carol Goddard and Captain Michael Eamer represented St. Lawrence Branch. The restoration, church service and the dedication resulted. June 19, 2005, Loyalist Day in Cornwall commenced with a church service at Trinity Anglican Church. The Recreated King's Royal Regiment of New York paraded into the church. Archdeacon Ross Moulton welcomed the Loyalists and theYorkers to this historic Loyalist church. Margaret Hall, Vice President, Central East Region and Kerstine Szederkenyi, a fifth great grand daughter of Jeremiah French did readings. Archdeacon Moulton gave a poignant sermon in which he compared the plight of the Biblical Hagar to that of the Loyalists. After the service, the guests enjoyed a hearty luncheon before proceeding to Maple Grove Cemetery for the dedication. Newspaper accounts indicated that about 150 people attended the church service and the ceremony. The dedication began with the Royal Yorkers in both their green and red uniforms parading the colours into the cemetery. Carol Goddard, President of St. Lawrence Branch welcomed the assembled people. Sylvia Powers, Past President of Sir Guy Carleton Branch was the co host. Sylvia's husband Bill is a descendant of Sarah French, a sister of Jeremiah French. Guy Lauzon, the Member of Parliament for Stormont and Dundas brought greetings from the federal government and spoke about the significance of preserving cemeteries. The Provincial Member for Stormont, Dundas and Charlottenburgh, Jim Brownell spoke on preserving local history. Gavin Watt, Commander of the King's Royal Regiment of New York explained why some Yorker uniforms were green and others were red. He also spoke briefly about the plight of Jeremiah French and his difficulties with the Queen's Loyal Rangers. Senior Vice President Peter Johnson, also a descendant of Sarah French brought greetings from Dominion Headquarters. William (Bill) French, Head of the French Family Association from Texas spoke about preserving family history. William French is descended from an uncle of Jeremiah French. Merle French, a member of Edmonton Branch and a descendant of Jeremiah French spoke about Jeremiah French. Merle French is one of only seventeen known descendants of Jeremiah French who bears the French surname. Margaret Hall, Vice President, Central Ontario East; Ray Lewis, Chairman of the Loyalist Burials Project; Myrtle Johnston, President of Colonel Jessup Branch; Robert Wilkins, President of Heritage Branch; Carol Potts, President of the SD&G Historical Society; Wendy Wert, President of the Sir John Johnson Manor House Committee; the Vice President of the Morrisburg & District Historical Society; and a representative of Upper Canada Village were each introduced and each said a few words. Janet Anderson, a member of Sir Guy Carleton and St. Lawrence Branches on behalf of George Anderson, a descendant of Jeremiah French, acknowledged and thanked all the people who came to the event, some from many miles away, and the many others who helped with the project. Archdeacon Moulton of Trinity Church then said a special prayer for Jeremiah French and others buried in the cemetery. Nicolette and Kaitlin Szederkenyi assisted by Margret Hamilton unveiled the new monument. These three young ladies are sixth great grand daughters of Jeremiah French and grand daughters of Mary Van Ryswyk, a member of St. Lawrence Branch. The Yorkers saluted and Sylvia Powers read the inscription on the new monument. Duncan MacDonald played Amazing Grace on the Pipes while those present were invited to view the graves of other Loyalists buried at Maple Grove. Other known Loyalists buried in the cemetery are Arthur Flaro, Albert French, Michael Hartle and Jacob Van Dusen.